Empathy isn’t a just touchy-feely, get-to-know-your-neighbors, appreciate-the-rich-tapestry-of-our-community, we-are-the-better-for-truly-understanding-the-perspective-of-another exercise in character building. When employed in classroom, empathy proves a nimble and dynamic tool for critical thinking, authentic understanding and demonstrating proficiency. I’ve long taught the value of diversity, tolerance and understanding of others’ points of view. For some time I served as co-advisor for our campus Civil Rights Team, developed interactive theater experiences around social justice issues, and raised consciousness in my classroom through music and film. But it wasn’t until I adopted design thinking -- empathy-fueled, human-centered problem solving -- as my preferred pedagogical lens that I became aware of how useful intentional empathy could be in the content areas. What follows is something of a prototypical day in my English classroom at Mt. Blue Campus, a regional public high school nestled into the foothills of rural western Maine. Here’s hoping this little bit of context and application inspire some ideas of your own. My crew of ninth graders love to build and tinker and create stuff. LEGO bricks, Jenga blocks, miscellaneous bits and pieces from our Maker Cart -- the materials matter little to these folks. They just want to create. George and Lennie’s dream of homestead and the current economic climate in Maine inspired a design challenge: How might we design a tiny house for the dreamers in Of Mice and Men? To get us there, we would use Mary Cantwell’s DEEP design thinking process, the second phase of which calls upon the designer to empathize with the user. On this particular day we first had to identify our users: who are the characters for whom we are designing? George and Lennie are the obvious users, but we also had to recognize Candy’s role in making the homestead feel more like a reality and Crooks’ offer to join them in the endeavor. Once our users and characters were defined, we had to identify their needs. The text serves as surrogate for an interview with the dialogue providing the subject’s words, the narration, the subject’s actions and behaviors. Using Crooks as an example -- a character chosen deliberately because he appears less frequently and provides less concrete desires about the homestead -- I quickly modeled for students how we can analyze what a character says and does to generate a simple hypothesis regarding what they may be thinking and feeling. I explained that our words can reveal our thoughts on a subject, while our actions and body language can relate our feelings. Often, what we say may not align what what are doing and those are the tension moments where what’s really going tends to be revealed. 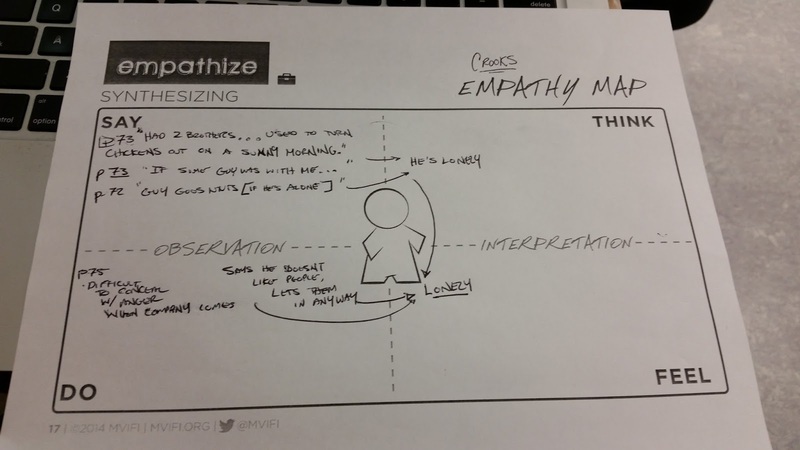 Typically, empathy maps are used by designers to unpack interviews. Again, for our purposes, the dialogue serves as “say,” and the narration serves as “do.” The dotted lines are there to emphasize the fluidity in the thinking and the interrelations between all four quadrants. In this very quick modeling for them, using MVIFI’s organizer,I wanted the students to see that Crooks, while he may initially say he wants to be left alone, invites the others to come and sit and that this likely relates a loneliness. This opened up a conversation about other characters who may feel loneliness, how the homestead might be able to relieve those feelings, and how all of these troubles and dreams affect the impact of the novel’s ending. This was also a great opportunity to teach students about the power of ellipses when quoting from a text. I didn’t want students spending all their time writing down quotes, but I did want to make sure their observations were documented. Despite having taught Laurie Halse Anderson’s Speak for over a decade, I continue to find opportunities to explore the text in new ways. As Grade 9 Humanities is team-taught by English and social studies teachers in the same room at the same time, we wanted a project that would explore current events, emphasize major themes of the novel, and provide an opportunity for students to create. Earlier in the fall, one of our students’ Cardboard Challenge turned out to be a sanctuary for her classmate. The idea of having a sanctuary is vital to protagonist Melinda Sordino’s experiences in Speak. Right now hundreds of thousands, if not millions of people in our world are seeking refuge and safety. Thus we challenged the students: How might we design a sanctuary for others? Step 1: Define Your Users/Characters. We provided three potential users: another member of the class you do not know well, a refugee or asylum seeker, or a character from Speak who is not Melinda. Two of the three would provide an opportunity to demonstrate content knowledge, the third being an opportunity to grow our classroom culture, and all would require deep intentionality. Step 2: Identify Your Users/Characters’ Needs. Providing structured time to explore each of the potential user classes afforded multiple angles into the novel’s themes. We investigated the Syrian refugee crisis and the rhetoric surrounding the current Presidential race and immigration reform, comparing and contrasting those positions to those expressed by characters in Speak. We ran a rapid prototyping session, partnering and creating mini-sanctuaries for one another using items off our maker cart including LEGO bricks, Jenga blocks, and assorted recyclables and crafting materials. And we explored Halse Anderson’s use of symbolism in the text and the insights it provides us into the various characters’ experiences and points of view. Step 3: Experiment and Create Based on Users/Characters’ Needs. And some students demonstrated deeper understanding of characters in the novel, such as this student who shared her process of designing a sanctuary for Speak’s Mr. Freeman. On my blog, I’ve documented use of empathy maps, design process, and making artistic representations to demonstrate understanding of literature, in this case the characters of Cunningham’s The Hours. Here, I wanted to express a more utilitarian approach to empathy in the class: asking what your partners need. As I write these words, we are wrangling with a long term design challenge in AP Lit: How might we design effective on-demand analytical essays? We are using the DEEP process to get us there and have used the last month for our Discovery phase. Using Diigo’s group collaboration features, we’ve been collecting resources and information related to effective timed writing in hopes that we’ll be able to find some trends and uncover some best practices, as well as the needs of the user: those who score AP Lit essays. 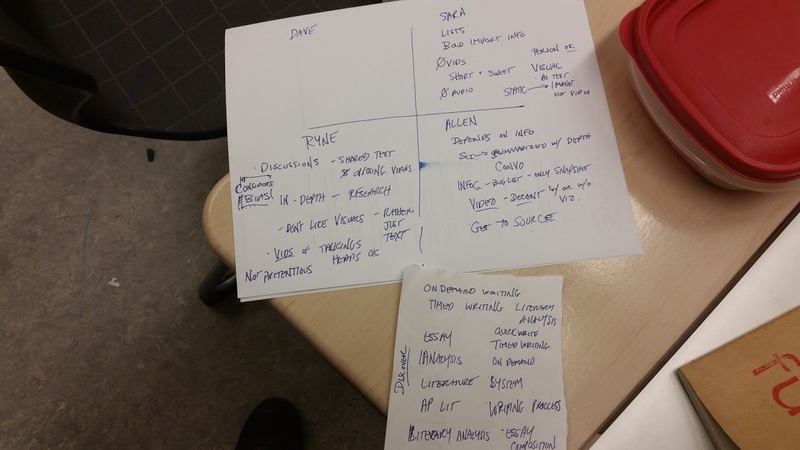 But rather than just find anything and everything -- which while having some merit can also feel overwhelming -- I had has run a very quick, 20 minute “design sprint” based on the needs in the room. Step 1: Define Your Users. We quickly (two minutes -- use a timer, it matters) brainstormed search terms to use for our research. This was our mini-discovery phase. Step 2: Identify Your Users’ Needs. Then we took the time to interview one another about how we like to consume our information. Digestible chunks? Long form articles? Video? Audio? And we took time to discuss why we prefer our information in these ways. It was important that no judgement was cast, that trends were identified across the room, and outliers were honored. Step 3: Gather Resources to Support Your Users. And here’s where the empathy phase played such an important role. In identifying the trends in the room about what formats of information are most helpful and useful, our next ten minutes for searching -- our experiment phase -- was that much more focused and more likely to generate meaningful results in our shared Diigo links. During production phase feedback, we noted the trends across what we found -- many lists, some scorer critique, few long form articles. Students now need to annotate what they found and it may be that closer inspection finds these links less than purposeful. That’s all part of the learning process though and least that revision will be guided by empathy and the meeting of a need rather than score point on a rubric. This is perhaps the greatest value empathy brings to the classroom. We so often discuss the challenge of making learning relevant -- especially in middle and high school classrooms. Exercises like those above push the focus away from grades and into the application of knowledge to solve problems. When we embrace empathy as an avenue for understanding, we not only foster critical knowledge of the content, but provide students vital opportunities to set aside their own biases and meet the needs of another, a skill that will serve them well no the directions our students’ lives take them. Dan Ryder is an educator, improviser and design thinker from the foothills of western Maine who spends every day trying to make the world a little more interesting than he found it. A moderator of #dtk12chat and #edchatme, follow him @wickeddecent on Twitter, Instagram, and Medium. Keep tabs on his efforts to walk the talk on his classroom blog at flight307.blogspot.com and with his co-conspirators at Wicked Decent Learning. Author's Note: This article originally appeared in St. John's Prep Today. I had the privilege of working with co-authors Director of Communications Elizabeth Forbes and Digital Learning Specialist Julie Cremin to put it together. Follow St. John's Prep on Twitter @stjohnsprep. In Alexandra Horelik’s history class, the iPads are open and students are intently reading about the first European colonists in New England and responding to questions. Look a little closer and you’ll see that as they read, Alexandra and her students are getting instant feedback about their progress. instantly, making it easy to adjust lessons on the go. From grade 6 through 12, students like Alexandra’s are engaged, teachers are able to assess students’ understanding in real time, and the classroom experience becomes more personalized. All of this is happening at the Prep thanks to formative assessment, a teaching and learning technique that takes advantage of the apps, software and other educational technology being used in classrooms today. 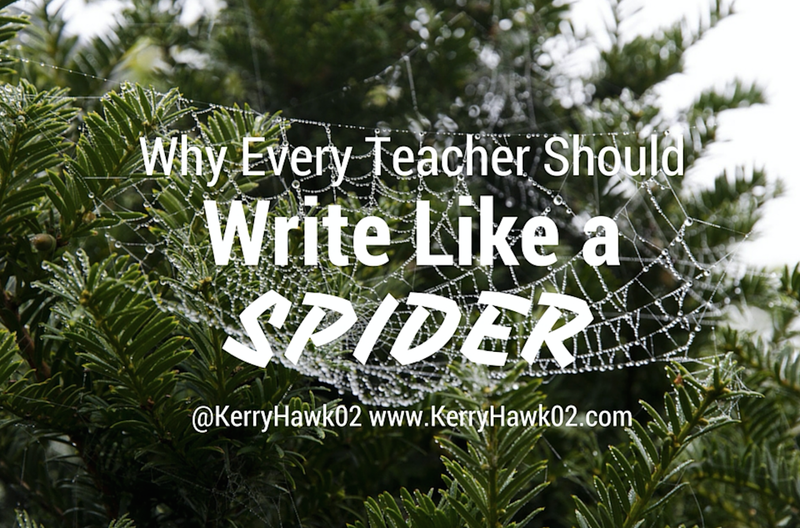 “Our teachers know their students better because of the ways they are using formative assessment. 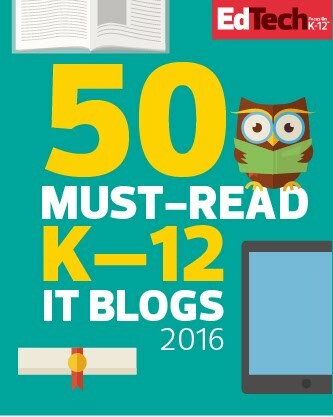 Students like learning this way too,” says Kerry Gallagher, digital learning specialist. English teacher Andrew Fondell often uses a formative assessment tool that incorporates video. He explains, “it allows me to select just about any video I can find online to use as a lesson for my students.” When his students experience this “lesson,” they are not only more engaged by the dynamic videos he chooses, they’re required to demonstrate learning when an embedded question, designed by Andrew, pops up on the screen. He says, “It only takes a few of these questions to convince my students that they need to watch and listen actively.” Using their iPads, students are able to work their way through the video and the questions at their own pace. 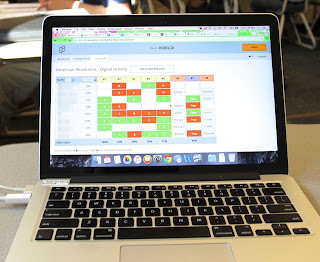 As his students carry out these activities, Andrew can see how they are doing with live data on his teacher screen. This is when the real magic happens. “I can get results to students when they are still pertinent to the current learning task,” he says. When he shares the data with the students, they are encouraged to ask questions and seek out extra help before the next test. Andrew has found that “students actually begin to crave formative assessments.” The evidence from the video activity shows them that they are learning. 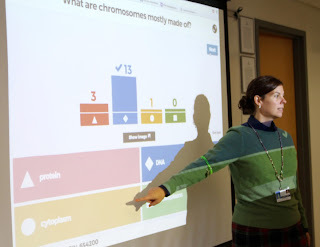 In her High School Latin classes, Elizabeth Solomon uses an iPad tool that allows her to embed quick activities and questions into her slide presentations. “I embed questions within an existing presentation so that students remain engaged and participatory throughout a class which was, traditionally, much more passive for them,” she says. form an exercise they did in class. personalized results in Ms. Prince's class. 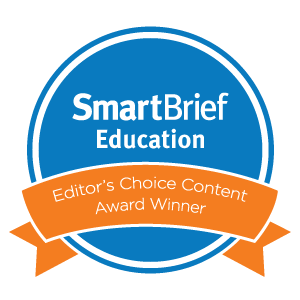 Two digital learning specialists help teachers and students make the most of the range of digital tools open to them, including those used for formative assessment. Julie Cremin and Kerry Gallagher both taught at the middle school and high school levels before coming to St. John’s. 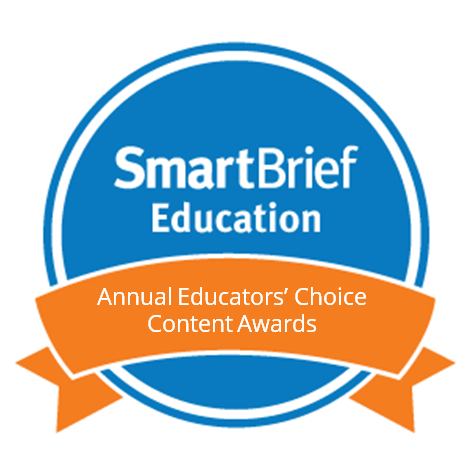 Their own experiences in the classroom give them valuable insights into how technology can support good teaching. “There’s nothing more rewarding than seeing a lesson unfold in ways that could not have happened without the tools we have available today,” says Julie. I just believe that this is what play should look like when done through technology. Rachel Fondell, a 6th grade humanities teacher, has something in common with Zach Lankow, a 9th and 10th grade religious studies teacher. While they both have a passion for reading, for working with their students, and for teaching their content, the commonality that is most striking is their willingness to give their students the freedom to play. They both use iPad games, which are traditionally seen as distractions by many educators, as a tool for learning and creating in their classrooms with their students. Recently, Zach told his story to the editors at EdSurge. 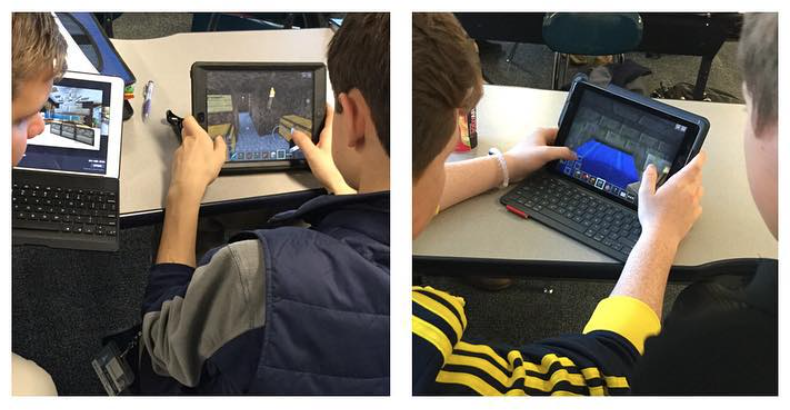 His students use Minecraft to build safe havens during the unit when they are studying the story of Noah’s Ark. They have to think about the details of the story, the message it is meant to convey, and which elements of survival need to be considered. His project is so innovative it was featured in the EdSurge On Air podcast recently. as they built their safe havens. I had the chance to observe Zach’s students building these projects. The room was loud and busy! 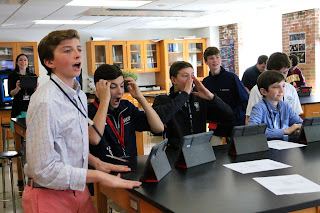 Skeptics might think this was caused by students being distracted by the game and a clash of noises coming from devices all over the room. Conversely, even though each student was working on his own personal device, they were working quite collaboratively toward the learning goal. The noise was a product of their excited discussions. Zach calmly visited with each group and gave them encouragement and feedback throughout the class period. Everyone in the room was on task the entire class period. It was really incredible. Zach’s students are in high school and are more mature than Rachel’s 6th graders. She felt the need to do even more research on games. 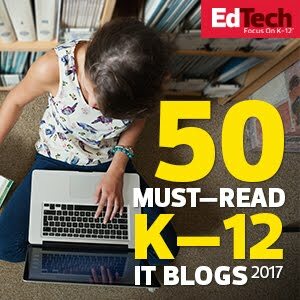 She explains, "In our 1-to-1 tablet school, I began researching in response to my young students' desperate desire to play games at school." Rachel’s school has built in times that are tech-free. For instance, students are not permitted to use any devices at lunch or at recess. But, there is a snack time that is less formal and her students have free time at home as well. 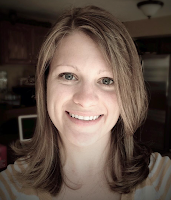 Rachel wanted her students to learn how to manage their tech use during their free time. So she had some conversations with them. "'Educational' games are often flimsy, don’t require critical thinking, and depend on rote memory. 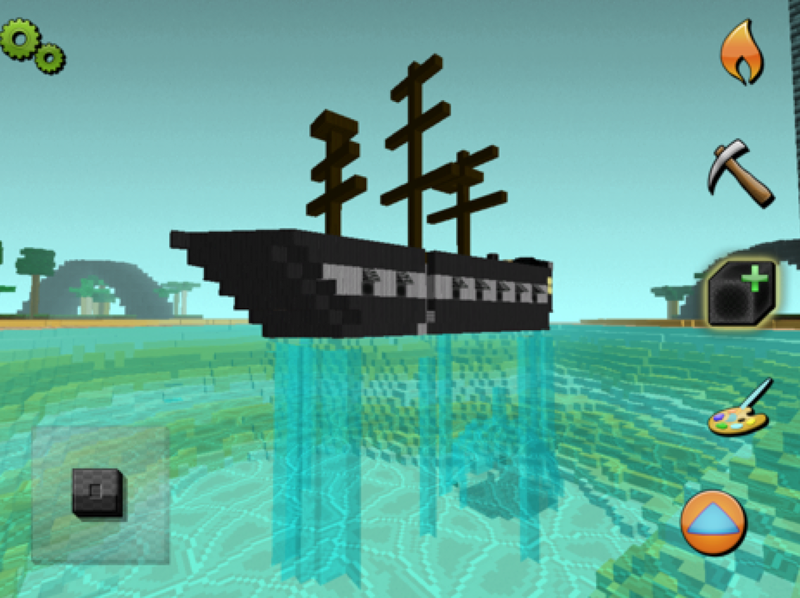 My students are attracted to games that most adults don’t consider 'educational.' I wanted something real, but not addicting. So we had a class discussion." When asked, her 6th graders told her that the aspects of games that make them feel like they can’t stop playing are badges, levels, collectibles, and virtual currency. They were able to share with her that they want to play and experiment, but agreed that they didn’t want to feel like they were addicted to a game. 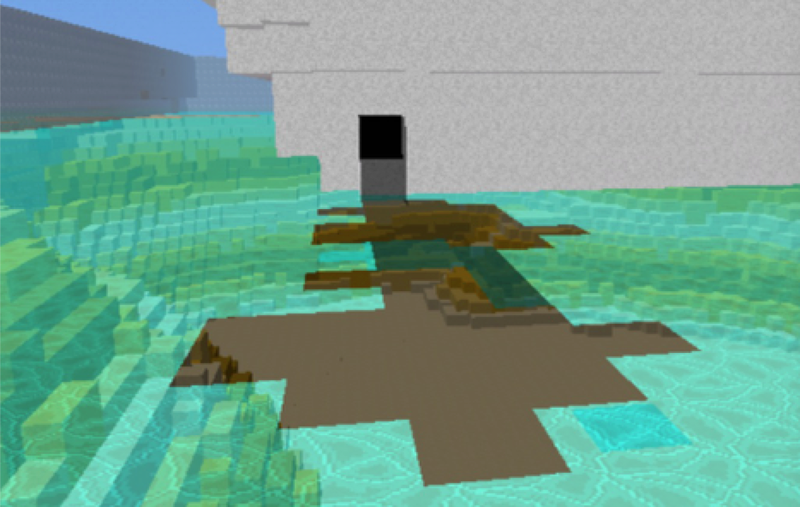 Rachel found Eden World Builder. She liked what she found. She said, "It has none of the addictive qualities my students identified, cost only $.99. It is like virtual Legos with unlimited combinations of blocks in many colors, textures, and with interactive properties. My students get to simply create and experiment." 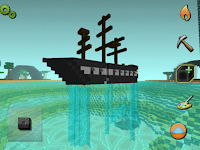 Common Sense Media’s review of Eden World Builder is also largely positive and recognizes the same qualities that Rachel likes. One of Rachel’s favorite conversations happened during this early roll out. She urged the students to play but to do so in a way that was helping them learn. One student looked embarrassed about what he had been doing with Eden. “I’m not using it educationally, Mrs. Fondell,” he admitted. “Show me what you’ve been doing,” she said. The student had been applying critical thinking skills, designing creatively, and testing the limits of a program, all without even knowing it. Rachel went on to have her students complete an in-class project with Eden. They have been studying the impact of humans on the environment in her humanities class, so her students had to demonstrate negative and positive impacts. 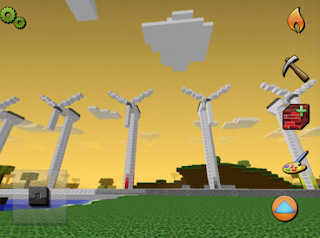 Creations ranged from wind turbines that help create clean energy to oil spills, both seen below. Rachel and Zach both processed the merits and concerns of gaming with their students before actually rolling out the games, and then continued to process these ideas as students actually played. 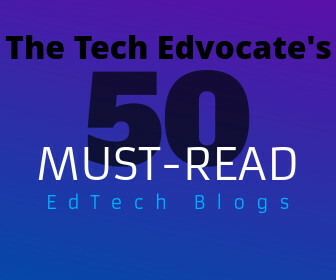 Not only are their students learning the content, thinking critically, creating some really cool media, and collaborating and sharing, they are also developing a key skill in our connected society. They are learning to think about how to use technology for learning and be self aware. Rachel Fondell is a licensed middle school teacher who is passionate about making learning hands on and engaging for her students in English language arts and social studies. She has spent nearly six years in the classroom, working with 9-13 year olds in private schools. Currently, Rachel teaches sixth grade humanities at St. John’s Prep, an all-boys Catholic School on the North Shore of Boston. This fall, she has enjoyed the challenge of implementing a 1:1 tablet program, striving to provide students with immersive, experiential instruction. Outside the classroom, Rachel loves to paint, tackle DIY projects, and explore the great outdoors with her husband and little red duck dog. She also moderates a middle school Yearbook Club and has been working toward her Master’s degree in Middle School Education.